One of the earliest known books written by one of the BrontÃ« sisters will feature in a BBC2 programme which has gathered together some of the most quirky and unusual museum items from across the UK to create an online 'Peopleâ€™s Museum' voted for by the general public. The programme, designed to coincide with Museums and Galleries Month, will feature Charlotte BrontÃ«â€™s â€˜little bookâ€™ of writings which makes up part of the Museum collection at the Parsonage. The Peopleâ€™s Museum programme will invite viewers to vote on their favourite museum artefact featured in the twenty-part series which will go out on BBC2 at 3.30pm five days a week - commencing on 15 May 2006. Charlotte's little book will be featured on 30 May. The object with the most votes will be proclaimed the winner on 9 June 2006, although featured objects will have a place in a virtual museum on the BBCâ€™s history website. Competition was fierce for inclusion in the programme as the producers, Reef TV, struggled through the enormous pile of entries from around Britain. The Parsonage is delighted to have been chosen and hopes that BrontÃ« fans across the UK and from overseas will register their affection for the BrontÃ«s by voting on the day. 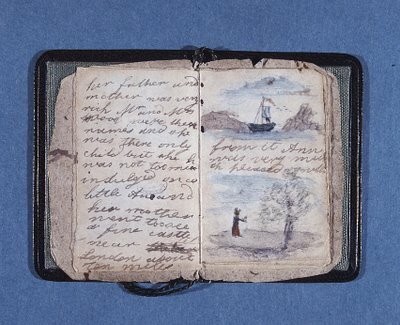 The tiny book, no bigger than the palm of a hand and measuring 42 x 64 mm, was believed to have been written by Charlotte between 1826 and 1829 when she was aged between 10 and 13, for her sister Anne. The book, bound in leather at a later date, is in immaculate condition and includes beautiful watercolour pictures and the original covers, which were made from tiny pieces of grey-flowered wallpaper. "This little book is the earliest surviving manuscript by Charlotte BrontÃ« and marks the beginning of her long apprenticeship in literature. It was an apprenticeship that would culminate twenty years later with the writing of Jane Eyre - one of the most popular books ever written.â€? The presenter, Jules Hudson, is an historian and archaeologist who has presented Channel 4â€™s Time Team and the BBCâ€™s Horizon programmes. He was fascinated by the little book whose writing is hardly readable. It is now rather fragile and delicate. Visitors to the Museum will be able to see the book on display at the Parsonage from June 2006. The BrontÃ« sisters are famous for their literary works, including Jane Eyre and Wuthering Heights; however their interest in writing had begun many years before during their childhood. The siblings conjured up plays and imaginative stories, inspired by a set of toy soldiers given to Branwell by Mr BrontÃ« in 1826. The children each named the soldiers after famous heroes of the time such as the Duke of Wellington and Napoleon, and from these toys they created their imaginary worlds and stories about Gondal and Angria now known as BrontÃ« Juvenilia. 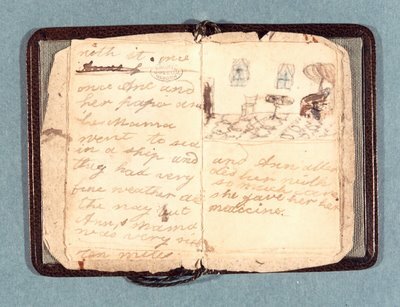 From this period onwards the BrontÃ« children produced â€˜little books,â€™ written in tiny writing and supposedly created small enough for the toy soldiers to read. It is also believed that many years of writing these â€˜little booksâ€™ could have contributed to Charlotteâ€™s degenerative eyesight. The minuscule script can be seen as part of a secret imaginary world that was shared between the siblings and hidden from prying adult eyes. 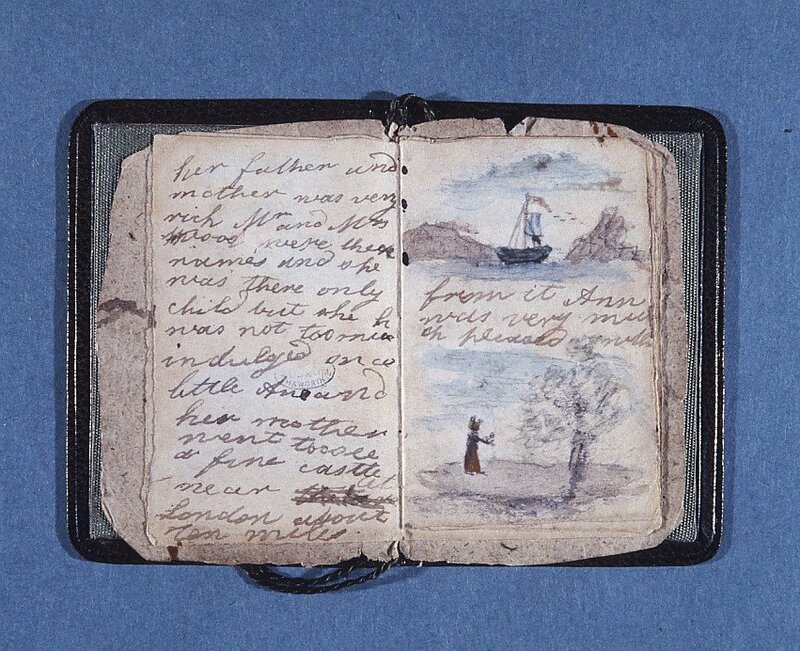 This â€˜little bookâ€™ originally belonged to Arthur Bell Nicholls, the husband of Charlotte BrontÃ«. After his death most of his BrontÃ« collection was sold in an auction in 1907. Unfortunately for the BrontÃ« Society at the time the â€˜little bookâ€™ was sold to a private American collector called Henry H. Bonnell. It resided with him until his death in 1926, finally â€˜returning homeâ€™ in 1927 when it was kindly donated by Henry Bonnellâ€™s family to the Parsonage, the place where it was written. Please see the BrontÃ« website for further details - use the link on the right. I do hope everyone remembered to vote! When I think of the Brontes, I think of these little books, and their house that I visited 10 years ago.